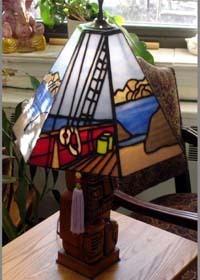 This lamp came from the coinciding of several different streams of thought. For some time I had wanted to build a lamp for my bedside table. My usual way of working is to be quietly working in my head on several ideas simultaneously, so I continued to work on other projects but kept the need for a lamp in the back of my mind. One summer I took a sailing cruise in the Virgin Islands, one of those vacations where you help hoist the sails and generally pretend you know what you're doing. I wanted to commemorate this trip but didn't know how. Then a couple of years later I was walking through a flea market and discovered the Tiki that would become the base for the lamp. Originally the Tiki was made to hold long fireplace matches. 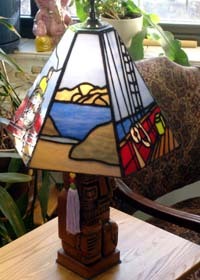 It was hollow and easily converted to a lamp base by adding a pipe, wire, light socket and harp. I filled the remaining space with sand to give it additional weight. With the last piece of the puzzle in place, I began to design the lamp. I had done a number of curved lamps before, but with the square nature of the base I decided that a panel lamp would be more appropriate. I did some experimenting with stiff cardboard to find the right size shade for the base I had chosen, then I used the Glass Eye 2000 "Lamp Wizard" to design the four different views for the six panel lamp. It's important that all the panels be the same size, and the wizard would make sure that they were. I set the wizard for six panels with a height of 9", a bottom diameter of 14" and a top diameter of 3½". The wizard then automatically gave me the outside shape of the panels. Using snapshots from my sailing trip and the background feature of the software I traced the basic patterns I needed. After simplifying the design and using the Suggest feature to correct difficulties, I was ready to cut my glass. I began with the simplest of the designs, the one that repeats. Once I finished the first panel I realized that I had a design problem. Originally the repeating panel did not include the large rock on the right. I had created a hinge, a line going across the entire panel, a weak spot that would easily separate from the rest of the lamp. Glass Eye 2000 made it easy to change the design and eliminate the weak element. Returning to Glass Eye 2000 I was quickly able to add the rock on the right. I like to work with small, "impossible" pieces. I used paint for the face, but everything else is with glass and copper foil. The lead lines give me the detail in the ship's planks and in the rigging. 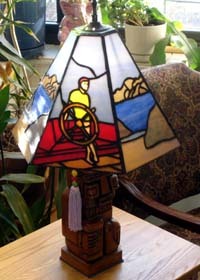 I considered doing the main mast simply by using a wider foil, but decided to use a separate narrow piece of glass. Once all six panels were finished it was a simple matter to join them together by placing them face down on my workbench, using masking tape to join them together and then lifting the whole assembly and joining the last two ends before soldering both inside and out. The final steps were to add the lamp cap, patina and put onto the electrified base. Richard Wandel began stained glass work about ten years ago, learning the craft through videos, books and experimentation. 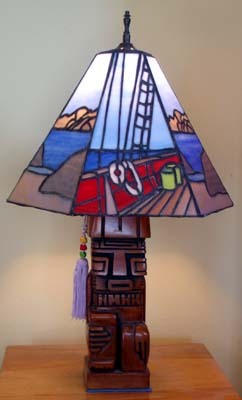 One of his earliest projects was a 300-piece lampshade. Some would feel that it was a project which shouldn't be attempted so early on, but he has always felt that in order to do good work you must do work that interests you. 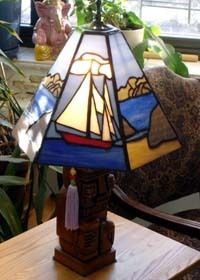 He continues to make lamps, as well as boxes and panels, mostly for himself and family, but he has also done a number of commissions. Although he doesn't do any advertising or marketing, he is always ready to show pictures of his work to whomever will look. Richard can be reached by email and is a regular visitor to the Glass Eye 2000 discussion group.